The “Rocket Single” at Johnny Rockets in Hanover, MD. The menu describes the Rocket Single as a “classic cheeseburger” that is served with cheddar cheese, iceberg lettuce, fresh tomato, white onion and Johnny Rockets “special sauce” (which my Dad says is just mayonnaise and ketchup mixed together in a bucket). The burger patty was tender and juicy. You can tell when burgers are cooked from fresh, not frozen, meat. This was definitely fresh. The burger was solved “old style” wrapped in paper. This is the Johnny Rockets style. They try to make their restaurants look like 1950s burger stands. It is a neat gimmick. Even the music they play is from the 1950s. The main problem with my burger was TOO MUCH SAUCE! There was so much sauce that I had to use a couple of french fries to scrape it onto my plate. It looked like the “special sauce” Hoover Dam had broken. Next time I’ll remember to ask for NO SAUCE or at least ask for it to be served on the side. I award this burger a score of 7 out of 10. It would have been higher (maybe an 8) if there hadn’t been so much sauce. My Dad saw this article in the New York Times and told me about it. 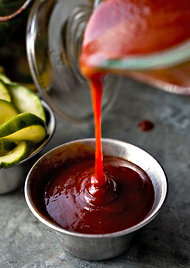 It is about making your own pickles, mustard and ketchup. This sounds like a lot of work when you can just buy them at the grocery store! What’s up with serving mayonnaise with burgers? 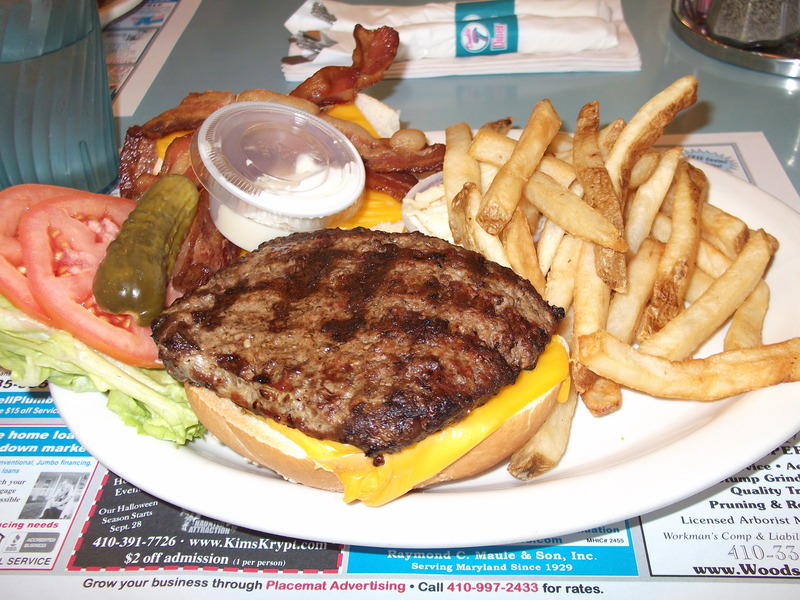 I stopped at the Double T Diner at White Marsh, Maryland and ordered their “Bacon Cheeseburger Deluxe” which is a 7 oz patty served with 3 slices of bacon and a slice of yellow American cheese. The menu says that the burger is made from “fresh beef”, but in my opinion it was cooked from frozen. Technically speaking, all beef was “fresh” at the moment it is butchered. Perhaps they meant it was “fresh” before it was frozen? The meat was average quality. I am guessing only 80% lean. The only juices that came out were white-colored fat, and not the brown meaty juices that Iexpect to see from a good quality burger. Weirdness #1: The burger was served with two tubs of mayonnaise. One was dumped on top of the bacon and the other was hidden under the fries. What’s up with serving mayonnaise with burgers? This isn’t Canada! Weirdness #2: If you want to put pickles in a burger then they need to be sliced, but the diner served a fat pickle spear. What’s up with that? Maybe that’s how they do things in Baltimore County, but not in the “normal” world. I award this burger 4 out of 10. We only stopped at the diner because we were hungry and miles from home. The burger is OK to satisfy your hunger, but I would not drive out of the way to get one. 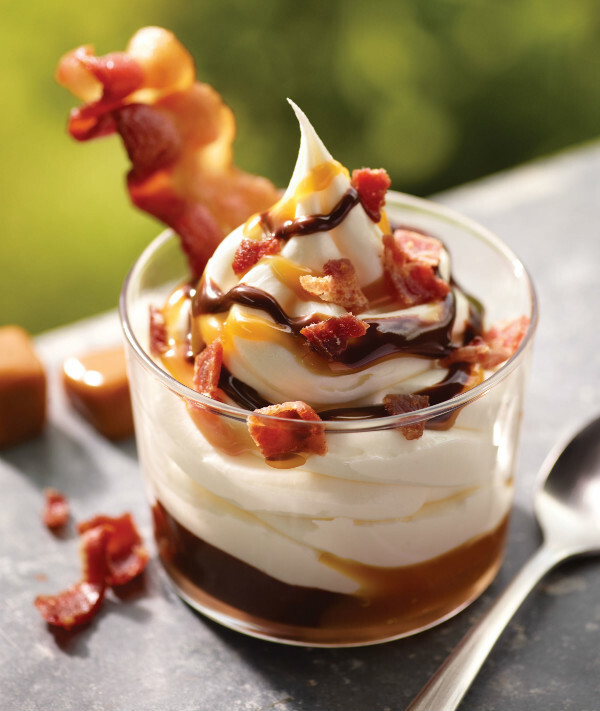 Burger King has a bacon sundae on its summer menu until Labor Day. Usually, I am in favor of any food that contains bacon (bacon cheeseburgers FTW! ), but this might be one step too far. Unless your name is Elvis. I found this interesting list of America’s best burger cities. I’m going to have a little chat with Mom and Dad about our future family vacations! 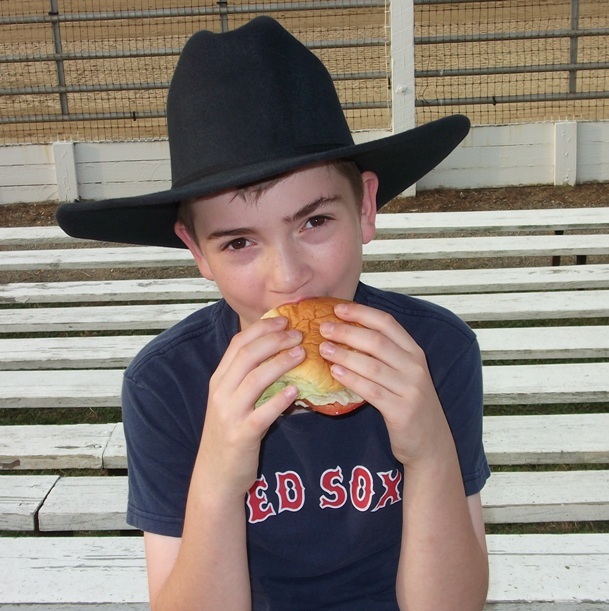 Here I am on a Saturday night eating a burger at the rodeo. 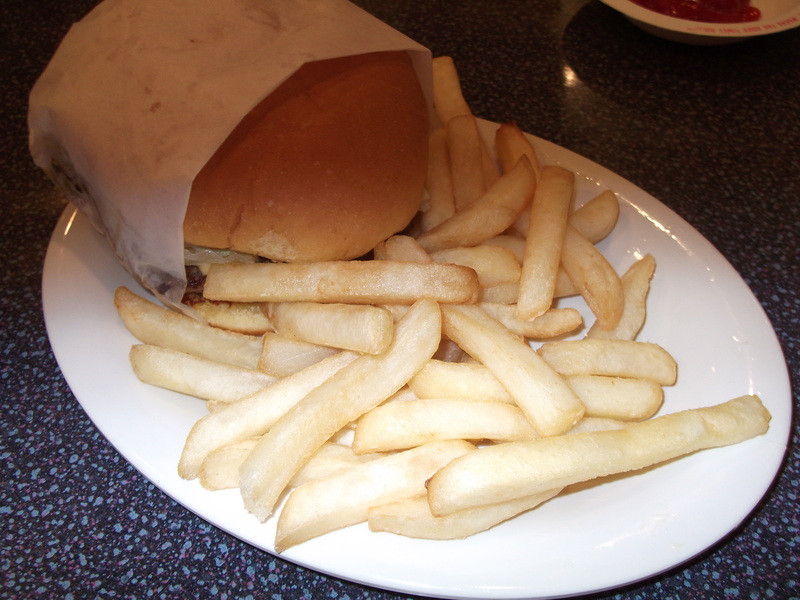 The burger is from Lapp’s Olympia Dairy Bar on US 40 in Carney’s Point, NJ. The rodeo is the Cowtown Rodeo just up the road in Pilesgrove, NJ. 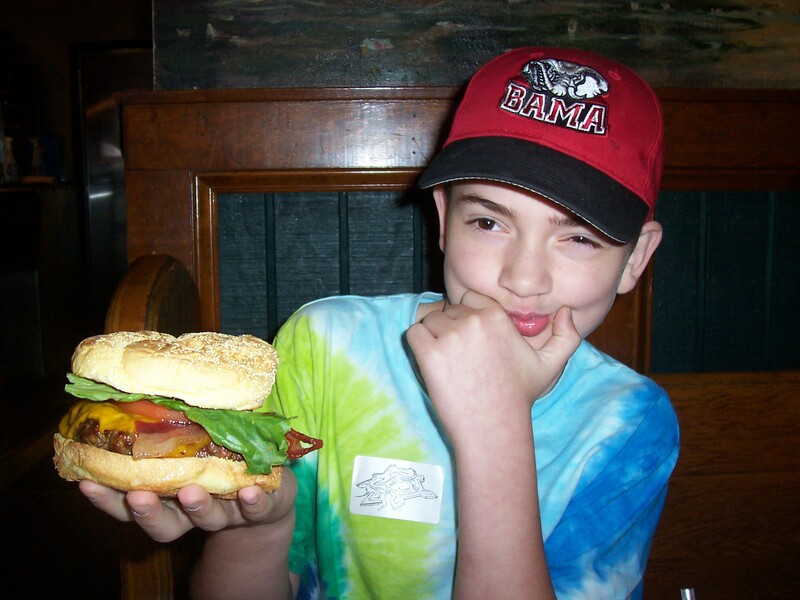 My blog was created because I love to eat burgers. I chose the name Burger Rodeo because I also love the rodeo. I can satisfy my love for burgers and rodeo by spending a Saturday night in New Jersey. The burgers from Lapp’s Olympia Dairy Bar are 1/3 lb patties of USDA beef We ordered our burgers “to go” because you can take your own food into the rodeo and we wanted to arrive early to get good seats. My burger was really good. It was juicy and the juices were brown and meaty, not just fat. This is how burgers should be. I had mine with lettuce, tomato and ketchup. I also had a side order of fries and a vanilla shake. Dad had a cheeseburger with fried onions. He also had a vanilla malt. Mom let him skip his diet for the night! That probably means he has to eat lettuce for the rest of the weekend. Mom had a cheeseburger with cheese, lettuce and pickles. At least today she didn’t ask for mushrooms and A1 sauce. I understand the A1 sauce (it’s good! ), but I really don’t like mushrooms. Why would anyone want to eat a fungus? It’s a disgusting idea! I award my cheeseburger 7 out of 10. 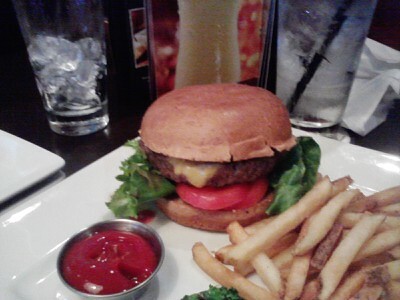 I was at Ruby Tuesday with my family and I ordered Ruby’s Classic Cheeseburger. This is a good basic cheeseburger. It was served on a whole wheat bun which I thought was a nice change from the usual sesame seed buns or kaiser rolls. There was plenty of lettuce and tomato so at least I got some vegetables and vitamins. The cheese was melted onto the burger patty nicely. It was American cheese, which is what I would expect to find on a classic. 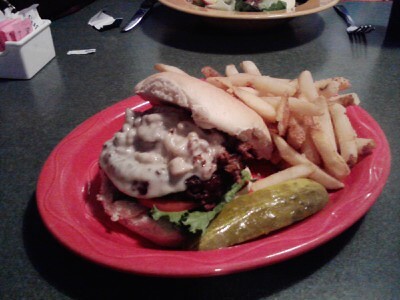 Here is a photo of the burger. The photo was taken with a phone camera, but I think it is still a good picture of how the burger is served. I award the Ruby Classic Cheeseburger a score of 6 out of 10. It is a good basic burger and one that you can’t go wrong with. Dad ate some weird salad thing because (#1) he is trying to avoid eating too many burgers, and (#2) Mom was there and he wasn’t able to break rule #1 without her finding out. Poor Dad! The burger patty was a little bit dry, but the toppings were interesting. The toppings are what made the burger worth eating. This is a shame. The burger patty should always be good and a restaurant should not rely on toppings. I award the Philly Burger a score of 5 out of 10. If I was judging the burger patty on its own I would only award it 4 out of 10. If what you want is a cheese steak then you should just buy a cheese steak. If what you want is a good burger then there are better burgers around.